Quebecers have surpassed the target set in 2008 of reducing single-use bag consumption by 50 per cent. A study commissioned by the provincial government found that in 2007, Quebecers used around 2.2 billion single-use plastic bags. By 2010, that number had dropped to about one billion, and Arcand said it may be even lower now. That surpasses the goal set by Quebec in 2008 to cut the consumption of single-use bags in half by 2012. For Quebec's busiest retailers, the reduction is even greater — reaching 60 per cent by 2010. "The results obtained clearly show Quebec's capacity to mobilize within a short period of time," said RECYC-QUÉBEC president Ginette Bureau. Arcand said pharmacies have more work to do to attain the target. Do you take your own bags with you when you go shopping? 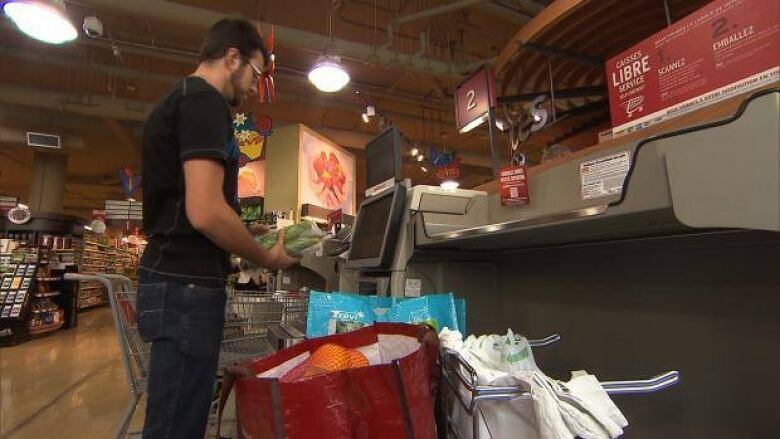 Many stores in Quebec now charge a five-cent fee for providing plastic bags. But Arcand credits Quebecers' growing environmental awareness for the shift in bag use. "People...view this as something very practical," Arcand said, speaking to reporters Monday at a Montreal grocery store. "It's a question of habit."